Protect Our Winters (POW), the Boulder, CO-based environmental advocacy group made up of elite winter sports athletes, again stepped up to the climate change fighting plate when its founder, Jeremy Jones, testified in front of the US Congress, about climate change and its effects on the outdoor recreation economy. AT&T Park, home of the San Francisco Giants, reached a 95 percent waste diversion rate last season. Given the greenness of the Bay Area, this may not be surprising. Perhaps surprising to some, University of Tennessee football has committed to going Zero-Waste by the 2020 season. Welcome to a chock-full GSB News & Notes. That Protect Our Winters (POW) is a mega GreenSportsBlog fave should not be a mystery to any reader. After all, it is the only group or association of North American athletes I know of that advocates and lobbies for climate change solutions. Think about what it would mean if, say, the Major League Baseball Players Association had, a la POW, slammed President Trump’s anti-climate change executive actions. That would be bigly from big leaguers, right? Hopefully, POW’s stellar and consistent example will inspire its players’ association cousins in the major team sports to follow suit. A pipe dream? Maybe, at least for now. In the meantime, GreenSportsBlog will continue to highlight POW’s #ClimateAction leadership. It was on full display April 27 when founder Jeremy Jones testified in front of the US House Subcommittee on Digital Commerce and Consumer Protection on the impacts climate change is having on the outdoor recreation economy. Why should Congress be interested? One good reason is that the snow sports industry generates $72 billion annually and supports 695,000 jobs, 70,000 more American jobs than our country’s extractive industries—coal, oil and natural gas—combined^. In the United States, average winter temperatures have warmed almost two degrees Fahrenheit since 1895, and that rate of warming has more than tripled since 1970. The strongest winter warming trends have occurred in the northern half of the United States, where snow is an integral part of the economy. US ski resorts have lost over one billion dollars in aggregated revenue between low and high snow fall years in the last decade. The corresponding impact on employment has been a loss of up to 27,000 jobs. These values directly reflect the fact that in low snowfall years, states see up to 36 percent fewer skier visits. In recent seasons, 50 percent of resorts have been opening late and closing early#. Testimony to the House Subcommittee on Digital Commerce and Consumer Protection on the vast impact of the Great Outdoors. Included in this 1 hour 44 minute session are the remarks of Jeremy Jones, founder of Protect Our Winters (POW). Two days after Mr. Jones’ turn on the panel, he and other POWers took part in the People’s Climate March. To get POW’s perspective on the march, click here. And to get POW’s almost daily take on the environmental issues of the day, follow them on twitter at @ProtectWinters. San Francisco’s AT&T Park is not only one of the most spectacular places to watch a game in all of Major League Baseball (McCovey Cove, aka San Francisco Bay, just beyond the right field wall, makes for a great vista and a phenomenal landing spot for home runs)—and, especially during some night games, one of the coldest—it is also one of the greenest. In fact, according to a story by Carolina Arauz in the May 8 issue The Skyline View, the student news site of Skyline College in nearby San Bruno, AT&T Park is the only MLB stadium to have won the Green Glove Award, given to recognize a ballpark’s recycling efforts, every single year since it was created in 2008. Aside: I’d never heard of the Green Glove Award before this story. If GreenSportsBlog is unaware that Major League Baseball offers a Green-Sports award, it’s not a stretch to say that MLB needs to publicize the Green Glove Award more. OK, now back to our regularly scheduled post. Last season, the LEED Gold ballpark’s landfill diversion rate was 95 percent, allowing the Giants to claim Zero-Waste status. Ten years ago, through a partnership with PG&E, the club installed Sharp solar panels on a canopy by McCovey Cove, over the Willie Mays Ramp, and on the roof of the Giants offices. Per Ms. Arauz, over the last decade, the solar system has provided enough energy to power over 5,200 homes, avoiding the emission of over 360,000 pounds of greenhouse gases. It’s one thing to help power the AT&T Park with solar power, but what about their legendary Gilroy Garlic Fries??? Are they made sustainably? You bet they are, thanks to the Giants and the good folks working the garlic fries stand by Section 119. The stand’s LED lights and ballast lamp starters use 36.5 percent less electricity than than standard incandescents. Signage is made of 100 percent biodegradable and recyclable materials. Carry trays are compostable and the cups are recyclable. And the green paint used is environmentally-friendly. So, if you’re in San Francisco when the Giants are home, enjoy beautiful, sustainable AT&T Park—especially the garlic fries. Just go to a day game if possible—or bring your parka! Neyland Stadium, the iconic home of University of Tennessee football since 1921, holds 102,451 fans, making it the fifth biggest college football palace in the US*. I’ve had the pleasure of attending a game there—if you find yourself in the Knoxville, TN area when the Volunteers are in town, do yourself a favor, buy a ticket and head down to the stadium on the Tennessee River. If you do go, you will be inside the latest big time college football stadium to be on the road to Zero-Waste status, with that goal expected to be reached during the 2020 season, according to a May 2 story in the Knoxville News Sentinel by Cortney Roark. Aggressive environmental action, as exemplified by UT’s Zero-Waste football games, stands in sharp contrast to the climate change denialism espoused by John Duncan, Knoxville’s Republican representative in the US House (TN-02). 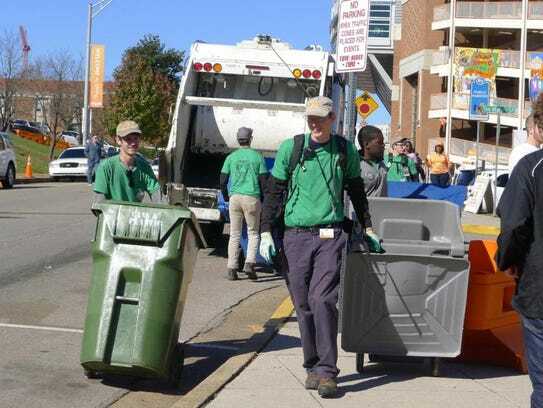 Significantly reducing waste at Tennessee football games is saving the university real money and is part of a campus-wide effort to recycle more. Roark’s piece details this point: 18 tons of garbage was hauled out of Neyland Stadium and recycled during the 2007 football season. The same amount of waste was recycled during a single game in the 2016 season, with some games reaching as much as 25 tons of waste diverted from landfills through a mix of recycling, composting, as well as donating unused food. Waste reduction on this scale has saved the university approximately $500,000 annually. UT Recycling Manager Jay Price told Roark that Neyland’s race to Zero-Waste begins outside the stadium. Staff members and volunteers set up recycling bins in the heavily trafficked tailgating areas and hand out recycling bag in other areas. Price said the staff strategically plans where material is most likely to be tossed in a recycling bin. “We go in front of the gates, because everyone has to drop what they’re carrying (when they enter the stadium),” Price remarked to Roark. “We’ve discovered that basically everything they’re carrying is recyclable, because it’s almost always beverage containers.” Inside the stadium, trash cans have, in some cases, been replaced by recycling and compost bins. The skyboxes at Neyland are getting into the sustainability act this year, as the food service will use 100 percent compostable materials. That means compostable food, napkins, utensils, cups and, most interestingly, the plates. Made from the lignin (an organic substance binding the cells, fibers and vessels which constitute wood and the lignified elements of plants, as in straw. After cellulose, it is the most abundant renewable carbon source on Earth) of East Tennessee switchgrass means that plates will remain in the region throughout the entirety of their life cycle. * The four college football stadiums with capacities bigger than Neyland are 1. Michigan Stadium (University of Michigan, Ann Arbor): 107,601; 2. Beaver Stadium (Penn State University, State College), 106,572; 3. Ohio Stadium (Ohio State University, Columbus), and 4. Kyle Field (Texas A&M University, College Station, TX).